I’ve been spending time daydreaming about both warmer weather as well as what I’d like to plant in my new raised beds. We’re located in Northeast Texas planting zone 8A so we enjoy a pretty long growing season but it seems spring just can’t come soon enough. I like to use primarily heirloom seeds but I still enjoying placing seedling plants in the ground each spring so I use an indoor greenhouse to get a jump on things. But how do I decide what goes in the garden each year? Of course the most important decision on what to plant in the garden is deciding what veggies we’d most like to eat. It doesn’t do much good to have a veggie plant take up valuable garden-area real estate all year if we eat it only in moderation. RancherMan & I love green beans and tomatoes, red potatoes and squash, jalapenos & onions so of course those things are a shoe-in for our garden. But how to decide what else to fill the garden with? One of the biggest planting decision aids for me is a spreadsheet where I’ve entered my garden layout. 2010 was the first year that I decided to track my garden this way & it took a little time initially to lay it all out. But each consecutive year I simply add another tab for the current year and copy/paste the garden layout to the current year. Then I start plugging in my planting selections. Plus I have past year garden plantings right at my fingertips to compare, as well as what variety seed I’m using and whether or not it’s heirloom. There are some permanent beds in my garden such as the asparagus bed and the Concord grapevines. But the other beds are mine to plant as I choose. 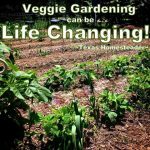 I know it’s wise to rotate your vegetables to a different location each year since different plants use different amounts of soil nutrition and attract or repel different pests. By rotating your crops you can (hopefully) outwit those pesky bugs and also soften the nutritional drain from your soils. Plus armed with my notes of last year’s garden I know what veggies didn’t do so well and which ones did. Sometimes failure in the garden is because of a specific variety I’ve chosen to plant. But oftentimes it’s all about location. For instance there’s a large tree just south of my garden. The sun shifts toward the north during the summer so shade from the tree is not an issue in those deep summer months. But in early spring when the sun is still somewhat southerly that tree can cast a shadow, keeping the soil from warming as quickly. Seeing in a past year that this was an issue with growth vigor, I now keep this bed for my cooler weather early spring plants. There are also certain plants that do not get along like squabbling children on the playground. I found out the hard way when I planted my green beans between two short rows of onions one year even knowing those two veggies don’t get along. I was lazy busy & didn’t want to dig up & replant my small onion rows on either side of the green bean bed so I figured “eh, let’s see what happens”. Bad decision. My green bean plants were in sad shape and produced small misshapen pods until they finally gave up early in the season. Lesson learned – no green beans next to the onions! As a matter of fact this year I’ve planted almost all of my onions in their own bed, far away from my green beans. Just like there are veggie plants that don’t get along, there are other veggie plants that are best pals. For instance, corn is a heavy feeder from soil nutrients but when you plant beans with them some of that nitrogen is replaced helping the corn to grow. If you then plant squash amongst the corn & beans you’ve planted the “Three Sisters” garden, each one complementing the other. And there are other benefits to best-pal veggie planting, some combinations actually protect each plant from pests. Did you know that planting garlic throughout your garden repels aphids & beetles? Or that planting onions & carrots together help control rust flies & some nematodes? Aaaahhh the plant world is remarkable indeed. By using my garden spreadsheet all of this information is on a tab right there on my planner so I can refer to it to make sure I don’t repeat the green bean/onion fiasco of 2011. Some years when planting season has sneaked up on me I’ve just rotated the beds – bed 1 was planted in bed 2, bed 2 planted in bed 3 and bed 3 planted in bed 1. All my companion plants are already together and enemies are apart. (c’mon now, play nice!) But for the most part I like to plan what goes in each section and using this spreadsheet it’s a snap! What are your tips for planting your veggie garden? This entry was posted in Blog Posts and tagged Frugality, Gardening, Spring on March 11, 2014 by Texas Homesteader. I am getting very excited about garden season. We are planning to plant our “first shift” of plants this weekend. Thanks so much for sharing with the Let’s Get Real party. Wow I just LOVE your big garden!! When we buy our land & build our dream house, I’ve already requested room for a garden 🙂 I currently have a small raised bed where I’ve planted okra, kale, basil, parsley & oregano and my husband said he’ll build me another this year, too! Yay! Squash, peppers, strawberries & cucumbers will go in there 🙂 Good to know about the veggie friends & enemies! Hopefully all mine get along! I never would have thought to plan my garden out on a spreadsheet! That’s a great idea, though, because my notes from year to year tend to get lost. I haven’t had even one raised bed for the past couple of years, but now that the baby will be a good 2 1/2 years old, it will be easier to get out there and work in the gardens this year. Pingback: March Garden Update - Trying Something Different! Thank you for taking the time to share this with us at Good Morning Mondays, because we are coming into winter you are giving us heaps of time to plan. I especially like the spreadsheet. Blessings to you and yours. Wow, you are way more organized then I am! I usually don’t make a plan till after I start my seeds (and I always start way to many.) Thanks you so much for sharing on the (mis)Adventures Mondays Blog Hop. I look forward to seeing what you share this week! Great idea! Thank you for linking up with Idea Box! Come back and join us next week! Beans, leaves, roots, fruits – I was taught that order for crop rotation! You really should publish an ebook. I can help you do it if you decide to. 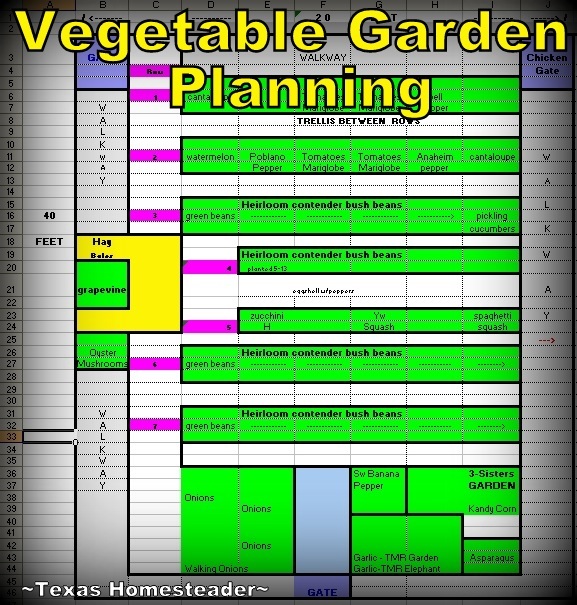 Thank you so much for this wonderful idea of using Excel for garden planning! I’m a newbie gardener (have only tried it for the first time 2 years ago) and I’m reading all sorts of ideas and tips. I’ve looked at gardening apps, but they don’t seem to give me the customization I need as my garden layout is a bit unique. Your post pretty much slapped me in the face: of course! Back to basics with Excel – why didn’t I think of that? Is this system still working well for you? I also like that you have a tab for companion plants (very helpful). What other tabs do you have to keep your plantings organized? Thank you again! ~M. Thanks for sharing this, it was chosen as a favorite on our From the Farm hop along with your post about pasta sauce…you’re pretty popular this week! Great tips! Thanks for sharing at the HomeAcre Hop! Thanks again for sharing your fabulous post on gardening. I’ve pinned this so we can plan a little better next year. Thanks for sharing this post at The Green Thumb Thursday Blog Hop! We hope you will join us again this week. 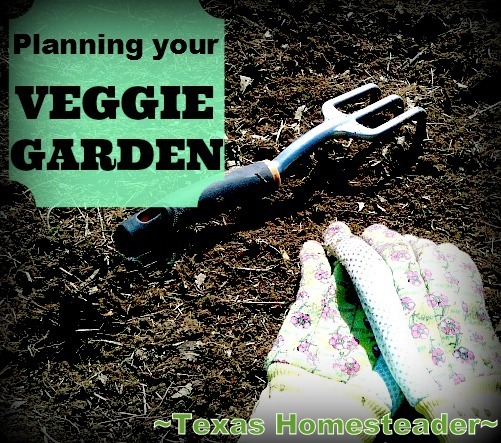 These are some great tips on planning your vegetable garden. I also pick what my family loves to eat and fill in everything later. I like to experiment with something new every year but this ensures that we get our favorites in first. I like the excel sheet idea! I usually just lay mine out on paper five different times before settling on something. This looks a lot cleaner and easier to change! That’s a nice dirt pokin’ stick! We don’t have a large place to plant veggies and plant in large containers instead. You have some good tips for what veggies to plant with each other and we’ll keep that in mind. Thanks for sharing your tips. Visiting from Marvelous Mon. Linkup. Thanks for sharing these tips! I’m excited to get mine started now! Found your link through Mostly Homemade Mom’s linky party. I live in excel all day every day for my day job – and I never even thought of planning my garden using it. What a wonderful idea! Thank you so much! What a fabulous post on garden planning! I love your design. That must be something to see! Hope you get to start planting soon. Thank you for sharing this valuable information on The Maple Hill Hop!